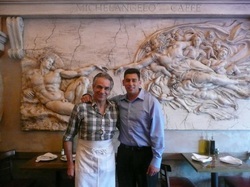 Celebrate authentic Italian food in the heart of North Beach at Michelangelo Ristorante & Caffe. Michelangelo's serves delicious Italian style seafood in addition to mouth-watering homemade gnocchi and other authentic Italian dishes prepared by chef Salvatore Cortara in this family owned restaurant. With pasta dishes that include pappardelle boscaiola, spaghetti alle vongole as well as their highly acclaimed veal saltimboca, there's something for everyone who enjoys reasonably priced, seasonal and authentic Italian cuisine. Want to see how gnocchi's made? Check out Salvatore's demonstration on YouTube.